But, will their bodies be the next ones discovered among the tombstones? Kim Carter has given us the second in her Clara and Iris Mystery series, Murder Among the Tombstones. Part cozy, part police procedural, Clara Samples and Iris Hadley are septuagenarians who decide to begin their second careers, by opening a private investigation agency in one of the rougher areas of Atlanta. Sounds like a perfect fit, except Iris doesn’t like to drive in traffic or at night, and Clara doesn’t have a lot of confidence. And did I mention a little thing called technology? … Ms. Carter surrounds her stories with very colorful characters. She lives in Atlanta, so she gives us a very realistic picture of the city and its citizens. look forward to reading more of the series and watching the faceoff between two very different generations. A fun series but with an opportunity to hold a mirror up to ourselves. I've been writing mysteries since 1999 when I became ill and housebound for a couple of years. I've always been inspired by beautiful and sometimes haunting places and always loved reading about them and figured I'd try my hand at writing haunting mysteries. Many of the novels remained on my computer for years before friends encouraged me to put them in print. The characters introduced in my new mystery series 'A Clara and Iris Mystery' with book one 'Sweet Dreams Baby Belle' where Clara and Iris are introduced and now fully developed in book two of 'Murder Among The Tombstones' where both very good friends of my mother and knew they had to be a part of this series! I will be writing a book from here in this series that takes place in each State of the US, which begins, of course, in both of book one and two in and around historical sites of Atlanta, GA. My third has released of this series, as the mystery takes place in Seattle, WA. I am currently writing and finishing the next one, book four takes place in New Orleans titled; "Murder On The Bayou." So readers watch for it soon! (Listed in the answer above) My mom grew up with both Iris and Clara. They are real 70 something, widowed Ladies. Kim Carter is an award-winning author of suspense, thrilling, and haunting murder mystery novels loved by avid mystery readers around the world. 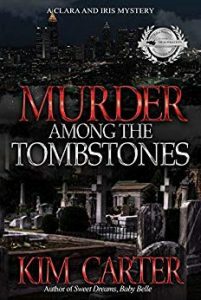 She was a finalist for the 2018 Killer Nashville Silver Falchion Award and a recipient of the 2017 'TCK Publishers' Readers' Choice Award' for her book "Murder Among The Tombstones." This is the second book in her Clara and Iris Mystery series, "Sweet Dreams, Baby Belle" introduces readers to the new series. The characters in this series are a couple of overly curious widows who become private investigators. These funny women were inspired by Kim's mother and her mom's best friend. Kim's writing career started after she suffered an illness that made her housebound for a couple of years. An avid reader of mystery novels herself, she embarked on writing as a means of filling her time. She began to share those early writings with friends and family who encouraged her to pursue writing professionally. Her health struggles and successes have been chronicled on The Lifetime Television in early 2000, The Atlanta-Journal Constitution, Women's Day Magazine, and Guidepost, and the upcoming late fall 2018 "Lifestyles" magazine by The Americus Times-Recorder. Prior to her illness, Kim worked in many different capacities in county government as her "Day Job," but ultimately, it was her job as a correctional officer that provided her the opportunities to talk and interact with a diverse group of people. Her experiences ran the gamete of inspiring success stories to tragic endings, much like her mysteries. Kim's books can be purchased online at Amazon, Barnes and Noble, BAM, and Indie Bound.